How do you check your UNISA Application Status? Don’t worry – we know how. 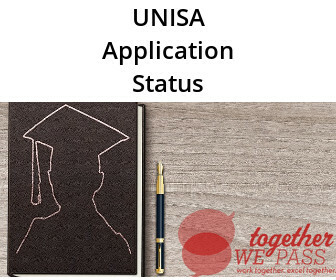 Follow our step by step guide and find out today what the status of your UNISA application is. Check that your contact details are up to date and correct on your UNISA registration, otherwise UNISA can not contact you. Go to your myUNISA website page to check and update your contact details. Next use the “Track My Application” form. Use the username (student number) and password you received when you applied. E-mail myunisahelp@unisa.ac.za if you have any problems accessing the site. We know that want-to-be UNISA students are waiting anxiously during every application period to know whether or not they will be accepted at UNISA to study or not. This can be a very testing time, as students really want to study. With UNISA’s announcement of Free Education in 2018, a record number of students applied to study at UNISA. Many of the qualifications are not being opened for applications because the qualifications are already full. Due to the huge amount of applicants, there are more and more students wanting to get accepted, and therefore fewer and fewer spots are available at UNISA. Therefore, be patient, make sure that you supply every piece documentation UNISA require of you to submit, and make sure it is in the exact format that UNISA specifies. Then you can be sure that it is not a small mistake stopping you from following your dreams of a university degree. First, check that your application information are correct and up to date on the myUnisa website. If you have not yet heard anything from Unisa regarding your application for admission, your contact information may have been incorrectly captured. Please go to this page: Unisa Admin to verify and/or change your contact information. Use the username (student number) and the password you received via e-mail when you applied to access this web page. It will take you through to a page that will let you track the status of your application. Please send an e-mail to myunisahelp@unisa.ac.za if you have any problems accessing this site. We wish you all the best with your UNISA application. Please remember it takes real patience to study with UNISA, so you need to be ready right from the start.